FundingSecure has become one of my favourite peer-to-peer lending platforms over the past few months. At first I was put off by the complicated secondary market, but over time I realised that there are also plenty of good opportunities. I’ve been buying loan parts on both the primary and secondary markets based on each individual opportunity, but lacked any overall strategy or understanding of my overall position. So, over the weekend I spent some time getting to the bottom of my account history, it was not straight forward. This uses a nested if statement to look for each possible option and map each transaction to a transaction type. 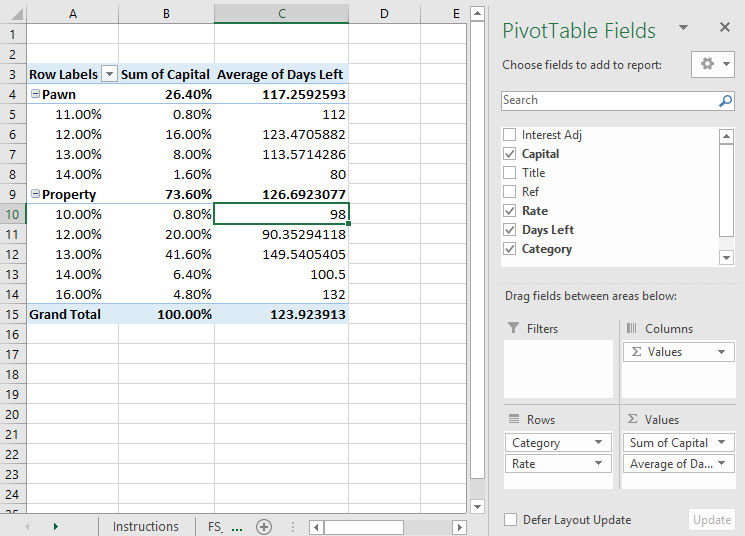 When writing an excel formula you can add a new line by pressing ‘ALT’ + ‘ENTER’ to make the formula easier to read. Using these categories I was able to create running totals for total lending, net deposits and my own calculation to check the balance. What troubled me was that my total balance came to around £400, but when I look at ‘my available funds’ on the website it was £0. Did £400 of my money disappear!? I realised that the difference was due to ‘Investments Awaiting Activation’. None of these numbers are included in the csv download until they are activated, even though my money has been assigned to the loan and it is accruing interest. One of my investments awaiting activation has been sitting there for almost 3 months, so this difference can become substantial over time and makes the csv download useless. The second problem is that this download has no detail on the loans themselves: their end date, rate of return or accrued interest. The only way I found to build a complete picture of my holdings was to go to www.fundingsecure.com/myaccount/current-investments and copy and paste the whole page into excel. In this there are two tables: ‘current active investments’ and ‘awaiting activation’. These two tables handle accrued interest differently and have a different layout so you need to treat them slightly differently. Finally I added a Loan Category Column, this was a semi manual categorisation of all loans into either property or pawn. You could speed up this labelling by filtering on the Title column (click on cell B1, then ‘Data’, ‘Filter’, then the filter icon), then searching for obvious keywords like ‘property’, ‘development’ or ‘land’ and dragging down the description. If you wanted to be really professional and create a reusable mapping you could create another tab with 2 columns: ‘title’ and ‘loan category’ with a list of distinct loan titles and your categories, with a vlookup or INDEX/MATCH from your main table to this. The awaiting activation table has slightly differently organised columns and calculates accrued interest on the number of days you’ve held it (not using the 30 day rule as the other table). There is no ‘date ending column’ so I chose to just manually give each loan 200 days remaining as a rough estimate. Once you do these changes you can paste onto the end of the first table.